For the past few weeks, I have been writing in my Studio Notes about what I’ve learned while developing this EcoMemory process and how I am improving the process with each new client. The next EcoMemory I created is for my friend Pam from Seattle. She has been involved with my EcoMemory idea from the very beginning. As I described this idea to her, how I wanted to make my art more personal and meaningful to my future clients by helping them reconnect to their special place in nature, she immediately told me she had a budget and she wanted me to make two for her. Double the fun! Of course, I was ecstatic. We settled on a time and we had a Skype conversation so we could feel like we were talking to each other in the same room, at least as much as you can, using a laptop screen. Pam described being in a rowboat on a calm lake in northern Minnesota early in the morning as a young child. She looked over the edge of the boat and saw these beautiful colorful sunfish swimming in the water. Now Pam is an artist herself and loves color as it is a way for her to express her ideas through her art. As an artist, Pam had the vocabulary to explain her memory in visual terms and how to translate it into Art. We got very specific about colors, the mood of the morning, the color of the sky. And the glorious fish...I was lucky to find a YouTube video of sunfish swimming underwater. I was able to get the exact color. This was the beginning of using reference photos to help get the colors just right. After the call ended I thought… Well, I want to document the things we talked about that are shaping my color palette and design work. The scientist part of me decided I’m going to write a written report with photos of the fabric color palette and design sketch as well as a description of why this special place and time are important to her. The birth of the EcoMemory Report. This way clients have an idea of what I am thinking about. If there is any part of the design or colors that they weren’t sure about, we could have that conversation before it was all sewn together. Pam’s EcoMemory “View From the Boat on a Lake Nos. 1 & 2” reflects the more minimalist design that Pam was looking for. That fabric for the fish was spot on. 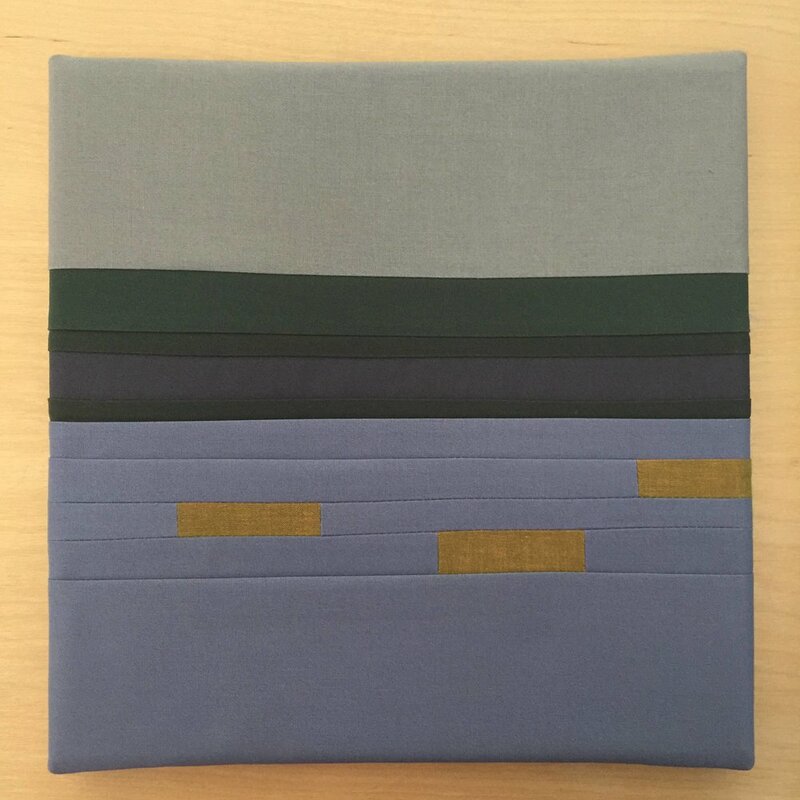 For you fabric geeks out there, it is a Kaffe Fasett shot cotton fabric with two woven thread colors of mustard and dark grey that creates a sense of depth opposed to the flat colors of the water and sky. Pam kindly created a cool time lapse video of her opening the package. It was awesome!! I asked her two questions to get feedback about the whole EcoMemory process. 1. What, specifically, was your favorite part of the custom EcoMemory process and why? I was so taken with our initial conversation and specific questions that transported me back to the location of the artwork. I felt the peace I felt as a child looking down on the colors of the sunfish and great depth of this beautiful lake. 2. If you were to recommend me to your best friend, what would you say? It was a magical experience and now every morning I am transported to one of my happiest moments in childhood. I love that the simplicity of color allows my thoughts to fill in the blanks. Reference Photos for the Sunfish and misty Lake that I used for Pam's artwork. The more EcoMemories I make, the more I learn how to better serve my clients. This EcoMemory experience with Pam taught me two huge things. First, her piece taught me the value of finding appropriate reference photos. Second, I learned how to formalize my ideas into a clearly written EcoMemory Report so the client could visualize their artwork before I started sewing it together. It is just the continuation of good communication between the client and the artist.